Euthanasia Prevention Coalition Euthanasia Prevention Coalition: She now opposes assisted suicide, after her husband died at a Swiss assisted suicide clinic. “We have done it to show the complexities of the argument. It’s not a black and white issue,” she said. 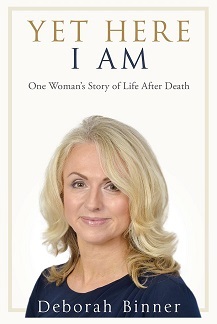 Almost 3 years later, Deborah published a book - Yet Here I Am - where she writes about her experience with the assisted suicide death of her husband and the natural death of her daughter Chloë a few years earlier. Simon learned about a film crew that was looking for a story like his when he contacted the Swiss assisted suicide clinic. Deborah Binner states that she is angry that her husband died by assisted suicide. Hopefully others will read her story and decide that caring is always better than killing. Interesting that after she has grieved that she has changed her mind about assisted suicide and of course she had the daughter's death to compare it with. I wonder if other wives or husband's in the same situation eventually are feeling angry a little way down the track. We don't often get feedback after an assisted suicide as to how people feel towards the one who has died.